DO MO SPEL (də mos-puhl) n.
1. Instead of, or in addition to, the Biblical account of Christ’s life and teachings, and his death and the cross and resurrection, and salvation for all believers – the focused teaching that mankind has a mandate to build the “kingdom of God” on earth, restoring paradise, by progressively and supernaturally transforming all societal institutions, through subduing and ruling the earth by whatever means possible, including using technology, science and psycho-social engineering; and then and only then will a “Christ” manifest his presence on earth. 2. The belief that the church must redeem the earth, “incarnate” Christ here on earth, be His “presence,” “advance” or build the kingdom of God spiritually and/or physically, transform society, rule and reign on earth, and reconcile and restore everything to its “proper” order. 3. The belief that the KINGDOM is the real message of salvation, and that Dominion over the earth is the chief end of man and the true gospel message. The belief that culture (including nations, societies) must be “redeemed” (i.e., “Christianized”), and that everyone and everything on earth is obligated to come under submission to the kingdom church. 4. The belief that the Fall of Man in the Garden of Eden can be reversed, including the idea that Jesus didn’t quite defeat Satan on the Cross and the church must finish the job in order to restore paradise on earth. 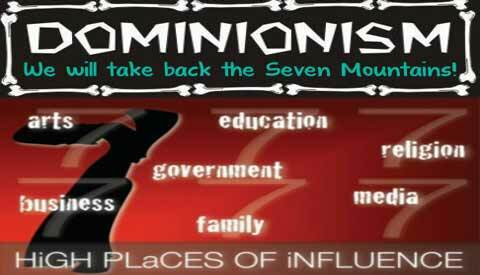 The tenets or practices of Dominionism, including the cultural mandate and/or social gospel, for evolutionary and/or progressive purposes of mankind, the church and/or the earth. 5. The belief that the church must operate with apostolic structures and/or small groups, utilize mystical techniques, and borrow spiritual concepts from extrabiblical sources in order to optimize the progression of humanity and/or the perfection of the saints on earth.